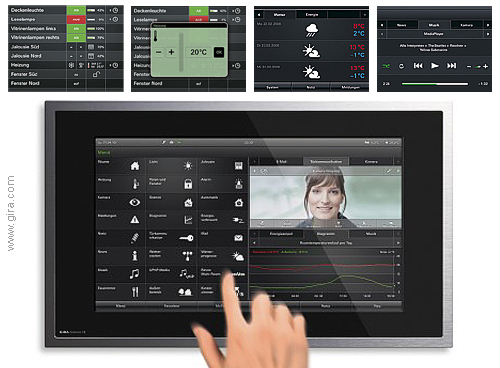 The Gira Control 19 Client is a PC-based control and regulation unit with an 18.5" capacitive touch screen. The clearly and intuitive menu guidance of the Gira Interface, allows quick access to the complete building technology functions such as lights, blinds, ventilation, heating and household appliances. Additional functions are the saving and calling up of light scenes, door communication, listening to music, using Internet applications, consumer device graphs and alarm messages. Dimensions: 546 x 15(wall) x 330 mm.